The ATHENA Leadership Award® was inspired by the goddess of Greek mythology known for her strength, courage, wisdom and enlightenment - qualities embodied in the ATHENA Leadership Model®. The Award is unique in both scope---local, national and international---and the ATHENA mission upon which it is based. 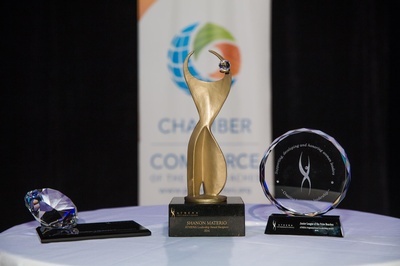 The ATHENA Leadership Award® is presented to a woman ---or man--- who is honored for professional excellence, community service and for actively assisting women in their attainment of professional excellence and leadership skills. 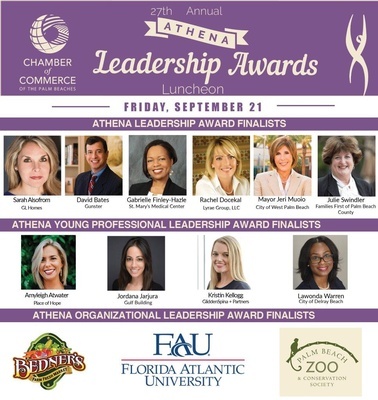 The ATHENA Young Professional Leadership Award, this award was established to honor emerging leaders under the age of 40. The ATHENA Organizational Leadership Award, this award was established to honor organizations and businesses. To purchase an ad in the program, please contact Marissa Kosiec at mkosiec@palmbeaches.org.